It doesn’t matter that my foot was smashed on the train. Or that a guy I was connecting with on Tinder turned out to be a creep (shocking!). Or that I had five hours of meetings. Today is the best day, because I’m going to my first Yankees game of the season! They’ve played two without me, and I’m experiencing my first case of FOMO. Well, fear no more. Today is the best day. 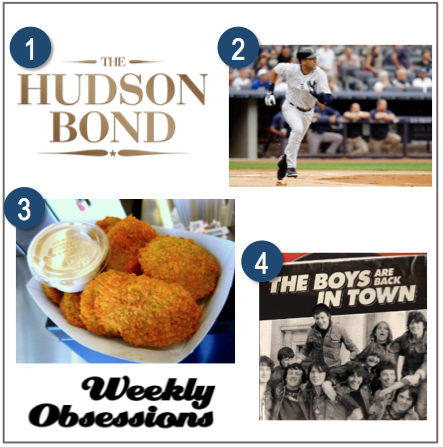 The Hudson Bond: Before the game, I’m hitting a quick work happy hour at this midtown spot. The weather is finally breaking, and we’ll be able to enjoy its patio even more in the coming months. Yankees Home Games: The smell, the sounds, the sights — I’m clearly more than excited for my first visit back to the Bronx since September. Brother Jimmy’s BBQ: Once inside, I have to hit up this chain’s amazing concession stand. I’ve been dreaming of the fried pickles for months, I tell you! “The Boys Are Back in Town” – Thin Lizzy: Well, duh. It’s no coincidence that this monster ballad has played on loop in my head all day. Let’s get ‘em, Yanks! Magz says : 04.09.2014 at 5:54 pm.p.